Arnold & Arnold, Ltd. is located in the historic Liberty Tower in Downtown Dayton. The Liberty Tower is a 295-foot high-rise office building designed and constructed by the Dayton architectural firm of Schenck & Williams. 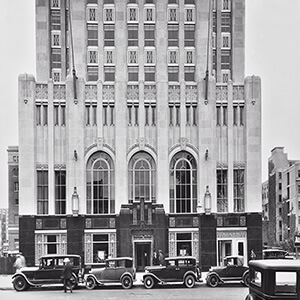 The building completed construction and opened for business in 1931. 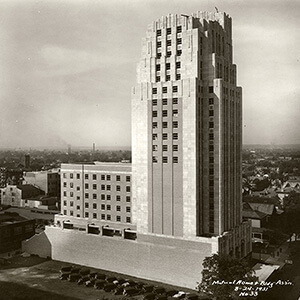 Liberty Tower, previously known as Mutual Home Savings Association Building, was the tallest building in Dayton from 1931 to 1969. The building is styled in the classic art-deco elegance and features a beautiful marble lobby with striking 30-foot ceilings. The building has a storied history in Dayton and was used as a lookout point for World War II air raids in the early 1940s, it became listed on the National Register of Historic Places in 1982, and was the filming location of the Hollywood film The Old Man and the Gun in 2017. Arnold & Arnold, Ltd. is proud to reside in one of the most iconic historical buildings in Ohio. Metered On-Street Parking is available throughout Downtown Dayton and around Liberty Tower. Hourly and Daily parking is available in the Schuster Center Arts Garage. The Arts Garage is located directly across the street from Liberty Tower on the North side of Second Street between Wilkinson Street and Ludlow Street.